Every-so-often the “retired” Larry Wood descends from his perch that overlooks the world of Hot Wheels to deliver us a new Hot Wheels design. In 2015, that casting design has been the Turbine Time which immediately began disappearing from the peghooks of local retailers when collectors and kids alike, fell in love with this wind-powered, jet-engine truck. The red version shown below was the initial release of this casting, showing up in the HW City Works mainline series. There is even a nod to Larry Wood on the “ELWOOD’s Garage” door graphic…something that we have seen numerous times before. Since its February 2015 release, two more versions have popped-up. One surprise version, was released at the Collectors Nationals Convention in Lexington, Kentucky. It was given to attendees of a special dinner honoring Larry Wood at the convention. The matte-black release featured a metal body versus its mainline counterpart which has a plastic body. The third version of the Turbine Time was just released in Late May / Early June as part of the Hot Wheels “K” Case Assortment. This release has a green plastic body. “Mr. 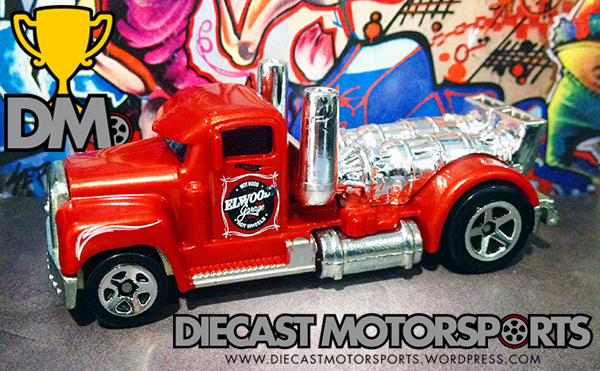 Hot Wheels”, Larry Wood has delivered another casting that adheres to the custom culture Hot Wheels was built on. The Turbine Time casting will certainly be popular for years to come.